I have been impressed with Dan Willingham’s work separating the wheat from the chaff in the world of educational psychology ever since I found his earlier book, Why Don’t Students Like School (Jossey-Bass, 2010), in which he explains what we actually know about teaching and learning, as opposed to what many people believe about teaching and learning without any scientific evidence to support those beliefs. Only this year I have I discovered his subsequent work, When Can You Trust the Experts? (Jossey-Bass, 2012), and I am kicking myself for not reading it sooner. It would have been an outstanding book to use with students when I was teaching IB Theory of Knowledge, which poses the questions, “What do we know, and how do we know it? 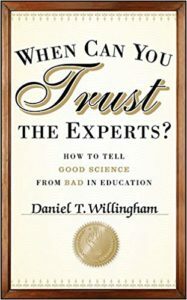 What do we believe, and why do we believe it?” Willingham addresses those questions in a practical way that would be especially valuable in a TOK class because educational psychology is a social science, and the social sciences deal with complex, messy human situations that make experiments, measurement, evidence, and conclusions problematic—but not always impossible. Willingham sorts through this maze of questions with the same wit and clarity he displayed in Why Don’t Students Like School? Anyone who has read about (or taught!) the Golden Ratio, for example, will be hooked from the first page. Anyone who has sat through long committee meetings thrashing out the wording of a school mission statement will enjoy his “do-it-yourself school mission statement,” which made me laugh out loud. Anyone trying to teach the “scientific method” will find a valuable resource, filled with clear explanations and vivid examples. Most importantly, anyone whose job involves curriculum decisions—high school department heads, school and district administrators, school board members, and state and federal officials and bureaucrats in departments of education—needs to read this book three times and consult it carefully before adopting a single new textbook or curriculum program. At a minimum, they should all photocopy Willingham’s “Exhibit 8.1: A Checklist to Be Completed Before You Adopt a Change,” distribute it to everyone in their organization, and direct them to post their copies prominently in their work areas. In fact, every teacher should read this book, and every parent with school-age children should read it. As Willingham writes, we need “individuals who are better able to discern good science from bad, institutions that are willing to help individuals in that job, and a change of mind-set for all in how science relates to educational practice.” Amen to that! Unmotivated students are uninspired students. Good teachers help them find a dream that will make the perspiration worthwhile. Inspire them first; then ask them to work. Those who are ready and willing to achieve at a higher level need work that inspires and challenges them, whatever their current skill level. Daily independent reading has been a constant component of my teaching, across multiple continents and curricula and exam systems, throughout my career. Why? Non-readers need to begin reading; readers with limited reading experiences need to be introduced to new authors and titles and genres; avid readers need to be guided to fill gaps in their reading experience and to take on ever more challenging books. These principles apply to all of my work: find out where the students are, and help them to move one step higher in the same way that one climbs a mountain . . . looking at the distant peak one moment, and at the path ahead of one’s feet the next. Author EricPosted on January 27, 2018 Categories Musings, TeachingLeave a comment on One step at a time . . .
For years teachers have been told, with great assurance, about “learning styles”. Daniel Willingham provides a welcome splash of cold water on these ideas. Have a look at his “Learning Styles FAQ”. I am delighted to announce that beginning in the fall of 2015 I will be teaching in the new high school program of Abiqua Academy in Salem, Oregon. I began my teaching career in 1980 at South Salem High School, but the opportunity to return to Salem 35 years later has come as a complete surprise. 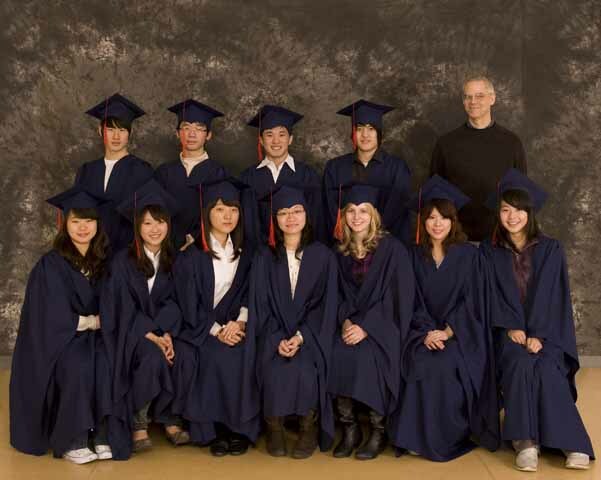 Pushing the age-limit for work visas in China, I needed to find a country and a school that was senior-citizen friendly. I was worried that I would be left with few choices, so I posted an open letter to my former students, asking them to write some ‘references’ for me. The responses were both slightly embarrassing and enormously gratifying. I am not sure whether they made any difference in my job search, but I do know that such comments from former students mean infinitely more to me than any supervisor’s evaluation ever has. When my Class of ’83 yearbook editor, Merideth Webber, heard that I was job-hunting, she mentioned it to another of my former students, Steve Thorsett. Steve returned to Salem recently to become the President of Willamette University. One of his associate deans, Norm Williams, who teaches in the WU College of Law, is the chair of Abiqua’s board of trustees, and he had mentioned to Steve that Abiqua would soon be opening a high school program and would be looking for teachers. Steve mentioned me to Norm, Norm gave my name to Jo Ann Yockey, Abiqua’s Head of School, and through this remarkable sequence of events I was offered a position this week, and happily accepted. From the National Council of Teachers of English, November 2004. Everyone has the capacity to write, writing can be taught, and teachers can help students become better writers. People learn to write by writing. Writing is a tool for thinking. Conventions of finished and edited texts are important to readers and therefore to writers. Writing has a complex relationship to talk. Literate practices are embedded in complicated social relationships. Composing occurs in different modalities and technologies. Assessment of writing involves complex, informed, human judgment. Evidence is mounting that sitting for long stretches of time — in a car, at a desk, or on the couch — is bad for our health. A sedentary way of life and spending hours sitting down seems to increase the risk of death from cardiovascular disease and cancer. . . . Research by Dr. Levine and others reveals that sitting for more than 2 hours a day is directly linked to health problems like obesity, metabolic disorders, increased blood pressure, high blood sugar, excess body fat around the waist and high cholesterol. Schools are going to have to change the way they do business, from the furniture they buy to the classroom routines that seem engraved in stone. The days of students sitting in desks for an hour at a stretch, hour after hour, are coming to an end. I have a little project for you—a chance to do some real good in the world. I teach high-school English. I know that my students need to read as much as possible, but I also know that reading alone will not give them the high-end vocabulary they will need for maximum success in school—for that, direct study of vocabulary words is required. The best web site I know for this purpose, Freerice.com, is run by the United Nations’ World Food Program. It has many virtues. It repeats words that the student cannot define the first time. It automatically adjusts the level of vocabulary based on the student’s responses. For every correct answer, sponsors donate 10 grains of rice to help feed hungry people. It’s non-profit, and free to users. Brilliant! However, the team running Freerice is small. They work on a limited budget. As a result, many more brilliant features that could be built in to the web site exist only on somebody’s list of great ideas. This is where you could really help. Why not temporarily release a small team of your programmers from their usual assignments and put them to work, as volunteers, to build Freerice into a really fabulous site that would attract even more students and teachers and generate more tons of food donations to the world’s poor people? “Why me?” you might ask. Simple: your expertise in building Gmail and Google Docs puts you ahead of everyone else in this area. Not Apple, certainly not Microsoft. You are the best. You could do this. You could make a real difference. How about it? Originally published in International Schools magazine and aimed at teachers considering a move to China. The classical gardens, first. Master of the Nets is my favourite: small, but it has all the elements. Not gardens in the Western sense, but homes for the well-to-do, built around a central pond. In a classical garden, art and nature melt into each other. Every doorway, every latticed window, every view down a bending corridor or around a corner, frames a picture as carefully designed as any work of art. I love to imagine the owner, retired after a difficult career of public service, spending his days sitting in a pavilion overlooking the pond, gazing out at the Taihu rocks and—walled off from the surrounding city—basking in the peace of a vast imagined wilderness as he sips his tea, smokes his pipe, and writes poetry in the beautiful characters he mastered so long ago. Once you have visited some gardens, go to the Suzhou Museum—not so much for the contents as for the buildings and grounds, which were designed by the world-famous I.M. Pei as a modernised, stylised classical garden. Pei’s uncle actually owned one of the gardens—the Lion’s Grove—and Pei played in the Taihu rock labyrinths that delighted my own children when we first arrived in Suzhou. (Taihu rocks are giant pieces of limestone, soaked for years in the waters of Lake Tai, the result a twisting, perforated greyish-white monolith that may seem to be a woman, a lion, or a distant mountain range.) Bring some fish food, offer it to the goldfish, and wonder at the swarm of colours as they compete for the morsels falling from heaven. Suzhou’s gardens and many of its other treasures—not all—survived the Cultural Revolution thanks to the easygoing resourcefulness of the Suzhou people. To protect precious bas-relief sculptures, I am told, they plastered over them and wrote “Long Live Chairman Mao” on the dried surface. Though the Red Guards knew what was underneath, they dared not destroy those words. As a result, the old city centre retains much of its look and feel from ancient days—which is not true of many, perhaps most Chinese cities today. Go to the Taoist temple in the middle of Guan Qian Jie, the ‘walking street’, or to the Buddhist temples at West Garden or Hanshan, and burn some incense, or have your fortune told. (The Taoist fortune tellers, in my experience, are more accurate.) If you go to Hanshan at the western edge of the old city limits, don’t miss your chance to walk over and gaze awhile at the huge barges going up and down on the Grand Canal, which stretches (at least in theory—not all of it is navigable today) from Hangzhou, two hours south of Suzhou by car, to Beijing—a public works project that vies with the Great Wall, though it is perhaps less picturesque. After that, stroll into the little shopping street where real artists have their studios, intermixed with the usual shops selling tourist curios. My favourite is the man who creates amazingly detailed paper-cut art, some of it kitschy, some jaw-droppingly beautiful, in sizes to suit any budget. Back in the city centre, take a Sunday afternoon to see a Kunqu Opera performance at the Kunqu Museum. For 30 RMB (about US$5.00) you can sit in the tiny theatre and marvel at the art of these singing actors whose every movement—down to the last fingertip—is exquisitely precise. You won’t understand a word, but it doesn’t matter. (Even most of the Chinese members of the audience need to read the lyrics on a very untraditional LED display over the stage, because the actors’ words are in ‘Suzhou hua’, the local Suzhou dialect). Kunqu Opera delighted one of the emperors on a visit here, and he imported Kunqu performers to the capital, where they contributed importantly to the development of Peking Opera. Kunqu, to my ears, is much more pleasant than its northern cousin. I like to sit on the side near the musicians, where I can watch them play in perfect harmony with the actors: cymbals, drums, dulcimer, and several stringed instruments. Amazing, humbling talent. Modern Suzhou is . . . modern! A brand-new 21st-century subway system just opened its first line last year. Shopping centres selling absolutely anything you could ever want are lit up at night—along with the rest of the city—like the Christmas decorations of drunken Dionysian revellers. Although prices have risen shockingly since I arrived in 2004, you can still taxi wherever you need to go on a teacher’s salary, and once you master the buses and subways—or buy an e-bike—transportation is very affordable indeed. Suzhou lies in the vast Yangtze River delta. The weather is wet and grey, the landscape similar to Holland, canals included, windmills (usually) not. Rainy springs; hot and humid summers; glorious autumns; and cold, wet winters with an occasional sprinkle of snow. The air quality is much better than Beijing, but much worse than Vancouver. If you are asthmatic, like me, invest in a good face mask; if you suffer from depression when deprived of bright sunlight, consider other destinations. As with most places, if you eat locally, you can live quite cheaply, but if you want to eat just as you do at home, be prepared to pay. You can buy just about everything here that you could in London or Los Angeles, but at roughly twice the price. As for all those stories about food adulteration, yes: it is a problem. But the truth is, millions of people here eat pork, fish, shrimp—and everything else—on a daily basis without ill effects. Much more dangerous is the traffic, which works on different principles than you are used to; let others do the driving until you acclimate. Suzhou is the perfect place, I think, to experience both old China and new China. I would not trade my decade here for anything in the world. Ten years ago I heard of the passing of Anne Osman, my friend and colleague from Casablanca American School, where I worked from 1986-89. Today I came across this piece that I wrote about Anne. It was published on an earlier version of this web site but was somehow lost in the move. This seems like a good time to re-publish it. Special thoughts and best wishes for Anne’s family. “I respond, therefore I am.” Eugen Rosenstock-Huessy, who fled from Hitler’s Germany in 1933, adopted these words as his personal motto. I have always understood him to mean that, whatever life threw at him, he still retained the ability to respond, and by that response he could preserve and extend his being. By responding in a certain way, he defined who he was. I was reminded of Rosenstock-Huessy this week when I heard the news that Anne Osman had finally lost her long battle with cancer. I was lucky to work with Anne at the Casablanca American School from 1986-1989. She was a warm and kind friend, a highly competent and supportive colleague. It was shortly after I left Morocco that Anne was diagnosed with cancer, and the initial reports suggested that she did not have long to live. I don’t think anyone expected her to survive another thirteen years. But she did much, much more during those thirteen years than merely survive. Anne exemplified Rosenstock-Huessy’s words better than anyone else I know: it is not our misfortunes that define us, but our response to them. Everything I heard of Anne from my old Casa friends told me that she responded to her cancer magnificently. When I knew Anne she was always modest and self-effacing, and never drew attention to herself. By all reports, she remained so. She continued to work—to serve the CAS community. Her service to others, her courage, tenacity, and dignity inspired everyone who knew her. Anne was a teacher. Her life teaches us that we are, every one of us, capable of responding with courage, dignity, and determination to the challenges and difficulties that confront us. She was a teacher, and a teacher’s first job is to inspire her students. Anne, you have certainly inspired all of us, and we will never forget you. First: we can never know what the author intended. Even if we ask the author in person, we cannot know whether the answer we hear is sincere, or truthful. It gets worse: the author himself cannot know with certainty what impelled him to write this or that. Why did I eat oatmeal for breakfast? I could offer you lots of reasons, but in the end I have no idea what impelled me to eat oatmeal. Second: it doesn’t matter. Literary biographers are interested in a writer’s life; literary critics are interested in a writer’s work. The personality of a writer does become important after we have read his book and begin to study it. . . . We can ask ourselves questions about it such as ‘What is the author’s name?’ ‘Where did he live?’ ‘Was he married?’ and ‘Which was his favourite flower?’ Then we are no longer reading the book, we are studying it and making it subserve our desire for information. ‘Study’ has a very solemn sound. ‘I am studying Dante’ sounds much more than ‘I am reading Dante.’ It is really much less. Study is only a serious form of gossip. It teaches us everything about the book except the central thing, and between that and us it raises a circular barrier which only the wings of the spirit can cross. The study of science, history, etc., is necessary and proper, for they are subjects that belong to the domain of information, but a creative subject like literature—to study that is excessively dangerous, and should never be attempted by the immature. —E.M. Forster, ‘Anonymity: An Enquiry’, from his collection, Two Cheers for Democracy. So we can all indulge in literary gossip, and we all can enjoy it. Tolstoy the man is as interesting, in his own way, as his novels. But we should not confuse literary gossip with literary criticism. Because, in the end, it doesn’t matter what the author intended. All that matters is what the author actually produced. Mark Twain may have intended nothing more than a sequel to Tom Sawyer; whatever his intentions, however, he produced Huckleberry Finn, and as readers that’s all we care about. I’ve always thought the public schools needed to study the best literature. I always taught Oedipus Rex to all kinds of what they used to call remedial or development classes. The reason those kids are in those classes is that they’re bored to death; so you can’t give them boring things. You have to give them the best there is to engage them. Scene: Wittenberg. A room in an inn. ‘Season your admiration’, good friend. In short, by a hair’s breadth and the grace of God. But sit you down, and I will lay it all out before you. Here, a bit of wine will do you good. Horatio sits and grips his wine cup as though it were the last real thing in his universe. I saw right away that to stay in Denmark meant certain death for me and those I most loved. I began with Ophelia, and together we wove a plan. Then came you, and the ghost. I wanted to tell you all, but feared to put you in danger should the king suspect you, and so I must beg your pardon, dear Horatio. But I saw you die, with my own eyes. I saw Ophelia buried. I saw you kill both Laertes and the king, and I saw the Queen drink the poisoned wine. Have I gone mad? Fie, fie! you are the sanest person I know. But eyes can deceive, good Horatio. What you saw was mostly theatre. Acting. Stage tricks I learned during my days with the players in the city. Only the king and, alas, old Polonius. That was the accident that nearly unraveled all my plans. But my lord, you killed the king with the same rapier that only moments before you pulled out of Laertes. How can Laertes live, if the king died? That was nicely done, eh? Laertes and I managed the rapiers very well. Of course, everyone was so alarmed by then, it was easy to beguile their senses with a sleight of hand. [Seeing Horatio’s incomprehension.] The rapier that seemed to kill Laertes was one I had from the players. The one I plunged into the guts of that villain was real. May he roast in hell! O, my lord, you cannot know, nor I cannot say had I a thousand years, how glad I am to see you here before me, alive and well and smiling. [They embrace, both shedding glad tears.] Tell me, though, how is’t with the Queen your mother? Still my mother, God be thanked, and no longer queen, I am glad to say. She was yet divided in her heart, though always loyal to me, but when Laertes told her of the king’s plan for the fencing match, all division ended and she became an eager player in our plot. And then, when the king did not stop her from drinking the wine that he thought was poisoned, all remaining sympathy was erased and she rejoiced in his death, though for the sake of our deception she could not show her happiness ‘til later. And where are they now— your mother, Ophelia, and Laertes? At home, such as it is, waiting to embrace you when I bring you there to greet them. With all my heart will I greet them, each and every one. But what of Rosenkrantz, and Guildenstern? Do they live? [Laughing] Aye, what a pair, those two! The king had no idea what actors they were. At moments they nearly convinced me of their villainy. They are in London, and from their latest letter it appears that they are making a name for themselves in the theatres there. Perhaps we shall go and see them, or better yet persuade them to return here and join us. We might make Wittenberg the centre of the world. Does Fortinbras know you live? Aye, aye, he was my back, had the fencing match not gone as I planned it. The great fool, he was just as happy to become king as I was to escape from that madness. Ambition, greed, grasping always for favours and power—what kind of life is that, Horatio? Not the sort that I should want, my lord. No, nor I. Shall we go to greet the ladies and Laertes? They await us. “How Shakespeare Changes Us”, at lit-hum.org. The first comment is worth a look, too. A Slow-Books Manifesto: Read books. As often as you can. Mostly classics. With empathy comes self-awareness, of course. By discovering affinities between ourselves and characters we never imagined we’d be able to comprehend (like the accused murderer Dimitri Karamazov), we better understand who we are personally and politically; what we want to change; what we care about defending. Author EricPosted on June 29, 2012 Categories For Students, Independent Reading, TeachingLeave a comment on A Slow-Books Manifesto: Read books. As often as you can. Mostly classics. Some e-books do now show page numbers, and when you copy a quotation from iBooks a limited bibliographical citation is included automatically. Tim Parks, writing in the New York Review of Books, adds usefully to the conversation. How to take notes—that’s the problem. With a Kindle book, forget it. The best you can do is select some text and then share it via Twitter or Facebook. Not useful. With Apple’s iBooks, it’s a bit better. You can select some text, copy it, switch to ‘Notes’, paste it, and then add whatever comments you want. But this is hardly practical for serious note-taking. 1. You select and copy text from the book. Along with the text itself, a bunch of meta-data is copied: author, title, date of publication, etc., everything you would need for a bibliographic entry. Since there are no page numbers in e-books, some alternative will be needed. Chapters will be useful in some cases. Beyond that, perhaps a ‘screen number’ plus a device ID (Kindle, iPhone, iPad, etc.) will be required. 2. When you copy the text, a pop-up menu offers you alternative places to paste the text. Ideally these would be mobile versions of apps like Evernote, Mendeley, EasyBib, and Zotero. You can simply paste, and then go on with your reading, or paste and switch apps, at which point you can add whatever tags and comments you want. 3. When it comes time to compile notes for review or to write an essay, your computer’s version of Evernote, Mendeley, etc., syncs automatically with your mobile version, and you’re off to the races. Until something like that exists, I can’t imagine widespread use of e-books by students. Because, what’s the alternative? Making notes on paper? Right. Not even Steve Jobs could sell that solution. Motivated students succeed, but since every student is different and every student has a different way to learn best, unless we can design an individual curriculum for each kid, the system won’t be optimized. . . . The only solution I can see is one teacher per student. And the only way something close to that is going to happen is through technology. And it’s coming. Cringely is often on the edge, or over it, but always provocative. He’s right to focus on the problem of motivation, or inspiration, but I’m not persuaded that technology of any sort can somehow inspire every student. That takes a culture, a family, an environment, and contact with inspired and inspiring teachers. The great literary critic George Steiner writes, somewhere, that just walking through the streets of Paris during his childhood was an education and an inspiration. Nearly every street and square in the city is named after someone who made a difference: scientists, poets, politicians, generals, intellectuals, labour leaders, architects, and on and on. Every intersection offers a new opportunity to remember someone notable, or to be introduced to someone notable. What if your school were like that? What if the institutional corridors with bland descriptions like “North Wing” or even more nondescript labels like “BN300″—what if all those hallways and common areas were named after famous people, people students ought to know about but far too often don’t? What if the names and why they are notable were explained on wall plaques? What if the building itself, in other words, were enlisted in the effort to transmit a sense of history and culture to young people? And why is such an opportunity so often missed? I just came across this piece about “stolperstein“, brass plaques embedded in walkways all over Europe commemorating Holocaust victims. This could be used in schools, too, not to commemorate victims, but to honour great writers, thinkers, scientists, etc. There is a limited number of hallways and common rooms in any school, but a nearly unlimited amount of floor space. The death of singer Amy Winehouse at the age of 27 connects, I think, with the terrible events in Norway. Both stories concern mental illness of a certain sort, and in both cases the social and cultural context plays a role. For Amy Winehouse: She was clearly ill, and yet in our culture she could not be forced to receive treatment, and arguably we don’t have very effective treatment as yet for problems such as hers. We can only wait for more effective treatments to be developed, but on the first point, what are the limits of personal freedom? Do we have an obligation to intervene when someone is clearly destroying herself? On Norway: In a culture that tolerates bigotry, xenophobia, racism, and violence, a few less stable individuals will inevitably follow these leads to their logical conclusion. Again we come up against the question of limits on personal freedom. We also confront the demons that afflict the human soul—to use a traditional way of describing them. Perhaps before too long the physical causes of such aberrations in brain structure or chemistry will have been identified: what then? In the meantime, we in international schools have a special opportunity to take seriously the proposition that people from very different backgrounds can not just live in peace but can come to know and understand and love one another—a proposition we see supported every day in our students. We need to give this more conscious thought and attention, and examine closely the areas in our own school communities where it is not yet completely true: where groups or individuals are, subtly or obviously, segregated from the majority. And in our national communities we need to be less complacent about pools of hatred, fear, bigotry, and violence. These sub-communities on the margins of society need attention, not neglect. And wherever we see the same trends, we need to speak out against them. Especially in political discourse, we must insist on dialogue that is respectful and non-violent. The mass media, which profit directly from sensation and scandal and controversy, must be held to account, as well. All in all, however, we can expect more such atrocities as happened in Norway yesterday, and more personal tragedies like the early death of Amy Winehouse, because the conditions that make them possible will change only very slowly. Congratulations to Steve Thorsett, Willamette University’s newly-appointed President, who was a student in my ‘World Literature & Philosophy’ class at South Salem High School in 1982-83. Steve has had an impressive academic career already, including a stint teaching physics and astronomy at UC Santa Cruz, where I studied as an undergraduate. Administration of anything—much less a university—is a huge challenge, and I wish Steve great success. He is the first of my former students to be a university president, so I am counting on him; I may not get a second chance ;^ ). ‎The clumsy formulations I grew up with—what is the moral of the story? what is the hero’s or heroine’s tragic flaw?—still influence and flatten the questions people often ask about literary works, as if there were one answer, and a right answer, at that. The genius of literary study comes in asking questions, not in finding answers. Or as I always tell my students, great literature doesn’t provide answers; it raises questions. Does reading great literature make us pessimistic? In general, our encounter with great works should tend to make us hopeful, and therefore optimistic. I have the words of several authors in mind when I assert this, such as Montaigne (“The profit from our studies is to become better and wiser men”) and Wallace Stevens (“It is not what I am but what I aspire to be that comforts me”). So long as we believe that we are capable of becoming better people in the world through the work we do (whatever that work happens to be) it is difficult to have a fundamentally pessimistic view of our own existence. If we believe that progress and development and improvement are possible for us as individuals (that it’s possible for me to become better than I currently am, whatever I mean by “better”) and we also believe that the work we do (the reading, the studying, the talking, the writing, etc.) can contribute towards that goal of “being better”, then I think it’s difficult not to be optimistic about the books and our work at the college. And if we don’t believe that we can become better than we are, then I’m not sure why any of us are here (or anywhere else) in the first place. Most of the points I have made in support of my argument are not such as I can confidently assert; but that the belief in the duty of inquiring after what we do not know will make us better and braver and less helpless than the notion that there is not even a possibility of discovering what we do not know, nor any duty of inquiring after it—this is a point for which I am determined to do battle, so far as I am able, both in word and deed. Thanks to Mr. Carl for permission to quote him. Author EricPosted on February 15, 2011 Categories For Students, TeachingLeave a comment on Does reading great literature make us pessimistic? Larry Ferlazzo: What Was The Best Education-Related Book You Read In 2010? Larry Ferlazzo asks that question, and many others reply: a great resource if you are looking for valuable education books to read. Thanks, Larry! Author EricPosted on December 6, 2010 Categories School Reform, Teaching1 Comment on Larry Ferlazzo: What Was The Best Education-Related Book You Read In 2010? We get mail . . . I am an ESL Instructor at [redacted] and I came across your blog and website. I enjoyed reading it and want to try some of your ideas. I also believe in independent reading (I call it extensive reading). Each student reads different books to the ones we read as a class. I have taught my ESL college-bound students for about 10 years requiring them to read a certain number of pages each day depending on their proficiency level. I started this at the English Language Center at [redacted]. It works, and every semester my students thank me for it too. I like your idea of having them respond on a blog. I will try this with my next class. I can’t express what a profound change class blogs have made to writing instruction. I highly recommend them! The details are more important than one might initially think: threaded comments, ‘Like’ buttons, lists of recent comments, number of posts per author, number of comments per author, etc. That’s why I use WordPress with the ‘Atahualpa’ theme, which can be customized so easily. If you start with a free option, I would recommend edublogs.org—run by teachers, it uses WordPress MU (multi-user), which has many (but not all) of the features you can build into an individual WP blog. Thanks for your previous response. The responses from your students made my day, and I’m glad you linked me to them. I’d read some of those responses in June, and I remembered why I wanted to try this in the first place. I’ve been making some changes to what we were doing. I was having the students answer a question each day about their reading in their diaries, and after looking at what you do again, I realized it was too much. You are right. If we want them to read, we can’t heap extras onto the students that take away from getting them to get into the reading habit. I think it’s going better now. I was pretty discouraged. Your message helped me, and I wanted to thank you for everything you’ve done to help me in succeeding in this. I thought I’d share a quote from one of my student’s blog entries. She did happen to stumble on a good match for her, but her response gave me a “fuzzy” teacher moment. My personal reaction to this book was different from all other books I have read. This book grabbed my attention from the first page. As I read this book I didn’t want to stop. I have never wanted to not put a book down. I used to hate reading, and now I hope to find more books like Sweet Hearts. These two correspondents, and others like them, have brightened my days. Teaching is hard work, and sometimes we do get discouraged—or at least tired :). So if you have learned something, been inspired, or otherwise benefitted from a colleague’s work, please do take the time to write a note of appreciation and brighten up someone’s day. Author EricPosted on November 8, 2010 Categories Educational Blogs, Independent Reading, Teaching1 Comment on We get mail . . .
I’m a big fan of Alfie Kohn. He’s deeply humane, unafraid to disagree with commonly accepted ideas, always on the side of students, tireless in his advocacy on their behalf—and he grounds his opinions in research. I often recommend his books—especially The Homework Myth and Punished by Rewards. Recently, however, he posted a piece titled “How to Create Nonreaders: Reflections on Motivation, Learning, and Sharing Power” on his web site after its appearance in the Fall 2010 issue of English Journal, and concerning part of what he says in it, I must disagree. At the very start of the year, the first day actually, Mr. Macknight already assigned us a daily homework, the homework was reading every day fifteen minutes. For the first couple of weeks, I didn’t really take it seriously and I must admit, I barely ready anything. But when our first report cards came out, I realized that my grade could have been better if I only read more, so decided to read much more. At first, I struggled a little bit, since it was a bit hard from reading almost nothing to about a bit more than a hundred pages a week. Something else that made it harder for me is my laptop, since I always wanted to go and do something else, but by reading every day, I also started reading different types of books, different styles, like thrillers, action, puzzle, etc. Reading so many different types of books taught me to like different authors, not one I always read like ‘Anthony Horowitz’, but not only did the independent reading help with that, it also made me learn a huge amount of new vocabulary. This will help me be ahead of people of my own grade in Belgium!! I wasn’t in Mr. Macknight class in September and we did not have independent reading or blogs. I did not read much until I came to English A. At first, I read a lot because I knew that the independent reading could make a different in my report card grade. I am not a native English speaker but I want to maintain my grade so I read novel every night after I finished my homework. Now, I did not read as much as I first came to English A because there were more and more projects and less spare time. You might think that this is an excuse, I think so as well, I became lazy, kind of. I think that I read better in the morning because my mind is clearer during morning when I woke up. I always fall asleep at night when I read novel and I don’t think I remember the events that happened. Sometimes, night gave me the mood of the character in the story and I felt scare of reading it. I read in the morning, which means I have less time for reading because I have to rush to school everyday so I read less. I changed from a person who wanted to get a good grade in report card so I read more books to a person wanted to dip into a friction that is full of imagination and adventures that I might not even see in my entire life or into a non-friction world that tells me what the real world looks like and how people survive in it. I read at lot in the beginning of this semester and I found out that I really like non-friction stories because I wanted to see the real world outside and how people manage to live in this “world” that we are going to join soon and after. I know I shouldn’t have just read one kind of genre (what I meant for genre is friction or non-friction) but I would try to read other genre that interests me. How did I change? I don’t know the answer. I just know that I read more and found out what I like and just go for it. I knew that I learned a lot when I read books. I learned new vocabularies, grammars used, culture of the certain country, life of other in real world, etc. I also know what genre or type of books do I like the most, which means I get to know myself better. Was I ever a good reader? I never was. If I was not in Mr.Macknight’s class and had to write independent journal, I wouldn’t have read a lot. Since my first language is Korean, not English, and even though I’m in Language A, it is hard for me to read books in English. Moreover, expression is different in English. That is why sometimes I don’t get jokes from books. Every time I don’t get what they character is saying, I asked my English speaking friends. As I learn many new stuffs from books, I began to read more and more (Some books, I didn’t write Ind. Reading journals). Back in 2009 September, I did not really read much book at that time. In fact reading was on my top dislike list, but now reading became one of my habits everyday. This change started from the day I entered Mr. Macknight’s classroom once again after grade 7. The course was still similar to the one before, but this time I learned a lot more from the books I read. Some of the most important reading experiences I gained this year will be to actually enjoy in reading. At first I was forced to read, as a 28 pages or more is needed to achieve a good grade, but as time goes on I started to pay a much closer attention to every vocabulary, every word, every sentence I read. Actually, what is most important to me will be to enjoy reading. Once you are in with the plot line, everything will go together naturally. For this summer, I am planning to read better quality books, as what I need now is to focus more on my use of language and grammar. Since English is not my mother tongue, and I am not that kind of person who loves challenging, I hated most of the things that related to English. When I first came to SSIS and read an english book, I almost cried, I thought I was too stupid. I took almost a month to read a book, even though my English skill became better, I still hated reading. I think I would not read even one book for this year if Mr. Macknight did not require us to read. However at the beginning of the year Mr. Macknight told us a good method which is “read what you want to read”. Even though it was pain in the neck to look for new vocabulary, I wanted to because I was curious to know next issue. And this make me spend more time on reading than before. Anyway from now I need to start reading more kinds of deep meaning book rather than entertaining books. So now, since I usually agree with Alfie Kohn, I have to try to explain why his theory predicts results that I only rarely see in my practice. In the opening of his English Journal article, Kohn writes, “ . . . it is impossible to motivate students”. But I don’t think of myself as motivating my students to read by giving them grades for it. I don’t even think of myself as rewarding them with grades. 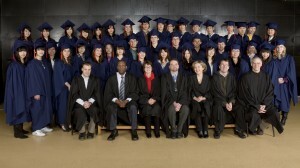 Instead, it seems to me that receiving grades for work done is, in the context of a school, simple fairness and justice. Grades, after all, are the currency of schools. Can I imagine a better, more humane way to offer education to young people? Absolutely. But in the meantime, we have the schools we have. And in those schools, students receive grades and credits and diplomas in return for the work they do. It’s a fairly straightforward transaction. Think of it this way: how should a student feel if she is told to do an assignment in school and then informed that she will receive no grades or credit for her work? But the grades aren’t motivation. And I don’t try to motivate my students at all, really: I try to inspire them. I try to make them believe in themselves and the limitless possibilities of their futures, and I try to show them that if they become readers they will open up doors for themselves. And once they start reading, with the right guidance and help, they begin to discover the joys of reading, and after that my work is easy. What a teacher can do – all a teacher can do – is work with students to create a classroom culture, a climate, a curriculum that will nourish and sustain the fundamental inclinations that everyone starts out with: to make sense of oneself and the world, to become increasingly competent at tasks that are regarded as consequential, to connect with (and express oneself to) other people. Motivation – at least intrinsic motivation — is something to be supported, or if necessary revived. It’s not something we can instill in students by acting on them in a certain way. You can tap their motivation, in other words, but you can’t “motivate them.” And if you think this distinction is merely semantic, then I’m afraid we disagree. A very small minority—one to three students per year—have responded to my Independent Reading program in that way. In such cases, I am ready to throw out the system and do whatever works. But in my classes, a very large majority of students are not “those kids who used to sit down and read for pleasure — the kids who would get lost in a book and have to be told to put it down to eat/play/whatever”, and most often the simple act of crediting them for their work is enough to get them started reading. If I found myself teaching a group of students whose inspiration to read was deflated by giving them grades for it, would I change my methods? Of course! But until then I will have to respectfully disagree with Mr. Kohn on this one point. High school writers looking for a place to publish their work should have a look at The Blue Pencil Online, a project of the Walnut Hill School for the Arts, in Natick, Massachusetts (USA). Their standards appear to be quite high, so for a young writer of real talent and ambition, the Blue Pencil just might provide the right sort of challenge. For a brief article about the site and the school, see this page from the National Association of Independent Schools. People want more of the story; they want answers. [But] it’s not a position paper. It’s an “issue” novel, but it’s a story. And so, what I hope to offer people are questions, as opposed to answers. By constantly encouraging students to explore the questions raised in a text—instead of searching for its ‘messages’—we will help them learn to be sensitive, perceptive readers. A great work of literature, as evocative as a tree or as the world itself, invites us to respond with our minds and our hearts, but it does not prescribe those responses. It invites us to explore, to reflect, to read and re-read. It does not say to us, ‘This is life’ or ‘This is the world’ or ‘This is what people are like’. Instead it shows us life, the world, and people, from a certain angle (or, more often, from a variety of angles) and asks: what do you think? what are you feeling now? Not surprisingly under such circumstances, most students simply retail ideas that their teachers or other sources have fed them. When the same interpretation of a work is repeated by student after student, it’s clear that they are repeating what they have been taught. To be sure, it is perfectly possible to tell a story, or write a play or poem, with the intention of sending a message or making an argument. Most such works quickly fall by the wayside and are easily dismissed. Perhaps they have some historical significance, but they are not taken seriously as works of art. Equally clear is the case that certain stories written for children and adolescents are written with the intention of teaching their readers to be kind to others, or to avoid illegal drugs and unwanted pregnancies. Again these are not serious works of art. Some children’s stories, of course, do achieve a standard recognizable as art, and they illustrate my argument here quite well. What is the ‘message’, for instance, of A.A. Milne’s ‘Pooh’ stories, or of Arnold Lobel’s ‘Frog and Toad’ stories? Like all good stories, these tales for children create an imaginary world that raises questions: Who are we? Where are we? What are we doing here, and what should we be doing? These are the questions raised again and again by literature and by other forms of art. What distinguishes literature from propaganda or moralizing tales? For one thing, the questions remain open: it is up to the readers or audience to answer them. Tolstoy’s Anna Karenina makes an interesting example. From the epigraph alone (“Vengeance is mine, saith the Lord; I will repay”) one could infer what the historical record shows: Tolstoy began his tale with the moralistic idea of showing us that Anna was a sinful woman deservedly punished by God. But along the way, a funny thing happened: Tolstoy seems himself to have fallen in love with Anna, at least temporarily, and at least enough to bring his moral certitude into doubt. Indeed, his alter-ego protagonist, Levin, visits Anna when she and Vronsky are living at Vronsky’s country estate. Levin, prepared to meet an immoral woman, finds her delightful and charming. Only when he gets home to his wife is his newly-sympathetic view of Anna brought down to earth with a bump. Anna does suffer a famously terrible end, but as readers we are not at all certain that she deserves her fate. As critics have often remarked, Tolstoy the artist wins out over Tolstoy the Christian moralist. The story that Tolstoy apparently set out to write would perhaps have ‘sent a message’; but if it had finished up that way, it would not be regarded today as one of the greatest novels ever written. The novel does not leave us with a message; instead it leaves us pondering a multitude of questions. I am not arguing, of course, that an author’s tone—his or her attitude toward characters and events—cannot be inferred. It’s clear that Tolstoy sympathizes more with certain characters than with others, but these sympathies and antipathies are not ‘messages’ that close off alternatives. On the contrary, when Tolstoy treats Oblonsky with comical delight, we wonder: why he should remain beloved by all—including the author—when his sister Anna (who is guilty of the same ‘sin’) becomes a pariah doomed to a tragic death? The search for messages in literature usually includes the notion that the author intended to send those messages, and that we can figure out the author’s intentions. Literary criticism has demolished this idea over the past century, and yet it persists. But why? It seems to be part of the moralistic theory of literature, going back to the Middle Ages, in which art is supposed to improve or uplift society. A story in which evil triumphs would corrupt the morals of the people. Therefore authors, by this account, should tell tales in which good is rewarded and evil punished. Clearly the morally uplifting message lies at the heart of such stories, and the intention of the author is to send that message. That this theory of literature persists can be seen in the familiar attempts to ban a book from the school curriculum or library. But the search for the author’s intention is even more elusive and pointless than the search for the story’s message. Even if the author were present, and we could ask her—”What was your intention in writing this story?”—we still would not know. Perhaps the author would lie to us, or would just make something up, not knowing herself what her intention was; or would tell us, “I had no intention; I just wrote the story”. Or what if, like Tolstoy, she began with an intention that the story does not fulfill, or only partially fulfills? Let’s take Shakespeare’s ‘Merchant of Venice’, for example. What if Shakespeare were here to answer: “Did you intend for us to sympathize with Shylock or despise him?” Would the answer, whatever it might be, help us to read, view, and respond to the play? No. Whatever Shakespeare intended or did not intend, we have to make up our own minds. We have to read the text, think about it, discuss it, and make up our own minds. There is no ‘right answer’. Adolescents, however, tend to think very concretely: they want right answers. Years ago I used to teach Dante’s Inferno and Chaucer’s Canterbury Tales back-to-back, and almost universally the students loved Dante and hated Chaucer. Why? In Dante ‘bad guys’ are punished in ways that are not only vivid and ghastly, but just. In Chaucer, on the other hand, we don’t know where we are morally. Everything is deeply ironic. The goodness of the good guys is doubtful; the bad guys seem to be both admired and worthy of forgiveness. Chaucer, in other words, is much more like the real world. Because adolescents tend to think in concrete, black-and-white terms, it’s even more important for us to avoid binary, reductive discussions of literature. We need to expand their comfort zones, help them relax with the idea that there is no ‘answer’ in literature, and give them the analytical tools to observe the details of a text, see how they form patterns, and explore the possibilities that they offer. *As an examiner for the International Baccalaureate Organization, I mark World Literature essays for English A1. Click on the photo to see it full-sized. America needs a culture that respects education. A culture in which learning is admired. A culture that honors the achievements of educated people and recognizes their importance to the entire society. Eggheads. Pointy-headed intellectuals. Ivory-tower academics. Bookworms. Nerds. Geeks. If President Obama and Education Secretary Arne Duncan hope to improve the dreadful state of America’s public schools they must tackle this culture of anti-intellectualism head-on. Just as President Kennedy launched a national drive to put men on the moon, President Obama should launch a national campaign to make learning respected among adults and cool among young people. So long as it’s cool to be a ‘jock’ or a ‘fox’ with barely passing grades, all attempts at educational reform will fail. Of course I trade in stereotypes with ‘jocks’ and ‘foxes’. But far too many young Americans over-value sports, clothes, and cosmetics, and under-value learning. America needs a culture in which young people admire their classmates who are excellent students; in which it’s the norm for young people to value learning and strive to achieve the best education they can. Advertising really does work: why doesn’t the U.S. government use the power of advertising to promote education? Companies granted use of the ‘public airwaves’ should be required to broadcast constant reminders of the value of learning to individuals, communities, and nations. If we can sell Barbies and Nikes, we can sell respect for learning. The government must take the lead here because left to their own devices, advertisers and the mass media will continue selling cosmetics and plastic and the latest fashions. There’s no profit for them in selling respect for learning. Great American thinkers, scientists, mathematicians, artists, and writers should be national heroes. Their names—not those of pop-culture celebrities—should be known among both young and old. Streets, public squares, parks, and public buildings in every town and city should be named for great intellectuals. They should be honored, and their stories told, at every opportunity. They should be the heroes that every young person idolizes. In such a culture, teaching would become a respected profession, sought after by top students just as today they aim to become doctors, lawyers, and scientists. Higher salaries, merit pay, and other such ‘incentives’ won’t motivate the right people to teach. The chance to answer a respected calling that serves the community and earns its gratitude will. Once the culture changes, many reforms involving curricula, teaching methods, graduation requirements, post-secondary education, vocational education, etc., become possible in a way they are not so long as the current culture persists. And then we can argue, too, about what education taxes should fund, and why. But until the culture is changed, the schools will continue to struggle, however their immediate circumstances are adjusted. I’m not arguing that everyone should get a Master’s degree. Rather, I imagine a culture in which factory workers, plumbers, carpenters, etc., all value learning and all participate somehow in the conversations, debates, and discourse that educated people engage in. These ideas go way back in American history to Jefferson’s yeoman farmer and the New England town hall meeting. All citizens should know the plays of Shakespeare, and understand science well enough to engage in an intelligent discussion of global warming or the theory of evolution. If they can’t, then they are excluded from the culture, and excluded from any constructive role in the decisions that must be made in a democratic society. I maintain that everyone of sound mind is capable, with the right education, of talking intelligently about Shakespeare, climate science, and Darwin. In my first teaching job we had a debate in the English department about tracking students who weren’t ‘academically inclined’ into classes where Shakespeare never appeared. I’ve yet to hear a good answer to the question I asked then: what right do we have to exclude people from the culture? If the illiterate groundlings could ‘get’ Shakespeare in the 16th century, then teachers can find a way to share him with all of our students today. The groundlings never read the text. And notice that poverty is not really the problem; one can cite many examples of poor people who value learning and strive to become highly educated. I once had a job helping a group of teenaged boys in ‘court school’ prepare for their high-school equivalency tests. I soon discovered that cramming for tests was not their problem. Their problem was the narrow world they inhabited. They knew about cars, beer, rock music, chasing girls, and not much else. Their problems were essentially cultural, not intellectual or academic. Change their culture and everything becomes possible; leave it as is, and very little is possible. I know Americans hate to hear that other countries do some things better than America does, but . . . it’s true. In France, for example, people of all classes have a much better level of general background knowledge than the average American (not that that is a difficult standard to exceed). Are Europeans genetically smarter than Americans? Of course not; it’s cultural. And culture can be changed, with effort. If the culture remains unchanged, no amount of fiddling with standards, curricula, length of the school year, etc., will work. A culture that respects learning would benefit America, of course, but it would benefit the rest of the world almost as much. A world superpower whose citizens don’t understand science, don’t know history, and take little interest in learning, threatens everyone on the planet.